Lakeport’s striking front entrance features contrasting colors and crisp lines, the latter of which span from the roof to the colonnaded porch. 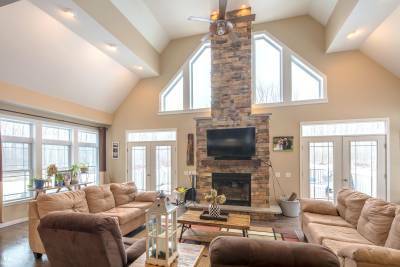 A step through the front door reveals a spacious living room with wood beams, a stately colonial-style fireplace and a great deal of space for furniture. Prairie-grid-style Silverline by Andersen windows with transoms allow plenty of natural light to shine through. 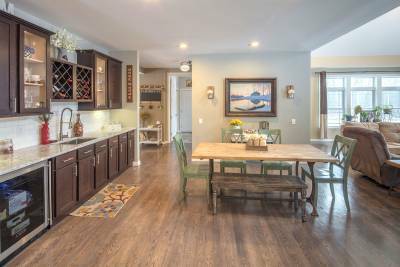 Entertaining friends and family is easy, thanks to Lakeport’s expansive kitchen and dining area. 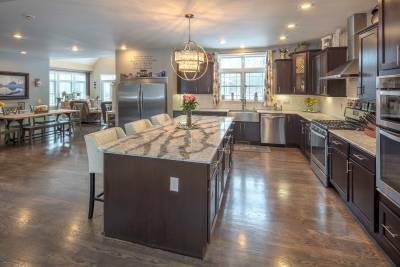 Peppercorn cabinets, Whirlpool® stainless steel appliances, granite countertops and a built-in wine rack provide sophisticated utility. The kitchen flows into the vaulted family room, which touts a stone fireplace as its charming focal point. This is yet another room in the home that offers abundant natural light, thanks to French doors and large windows and traps. The second floor of the home features three large bedrooms (in the modular section of the construction) with dual bathrooms. 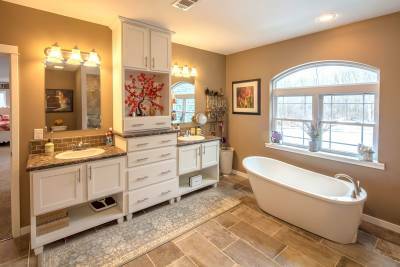 Additionally, a sizeable utility room includes ample cabinetry and work space areas. The master bedroom suite is located above the site-built garage, resulting in a space that is both vast in size and incredibly private. Highlights of the room include a huge walk-in closet covered by a unique barn door and a luxurious master bath complete with a tiled shower, freestanding soaker tub, his-and-her vanities and considerable storage space. 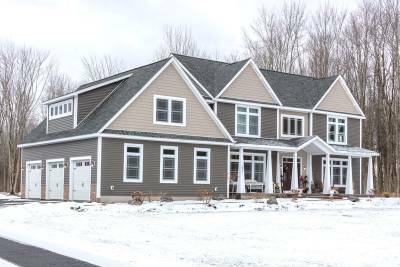 The exterior of the home includes large false dormers, a covered porch and an appealing mixture of siding and stone features that elevate the home’s curb appeal. Fill out the form below and a New Era representative will get in touch with you.